Louie the Clown is...The Super Car Guy? As you might have heard, Joyland’s historic mascot Louie the Clown was recently found after having been reported missing for the last ten years. As the world’s only (that we know of) animatronic, organ-playing clown, Louie made a strong impression on generations of Joyland visitors. Some found him scary, others adored the uniqueness. Whatever your reaction might have been, Louie was simply impossible to ignore. 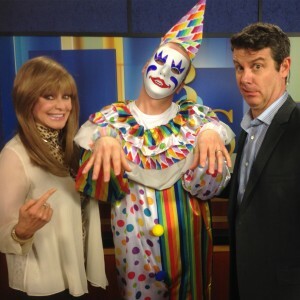 Well, Louie was spotted again at the KWCH television station on the Brett & Sierra Show, and even performed a dance to promote this year’s upcoming Gridiron show at the Orpheum April 16-18. Gridiron is a sketch comedy show written by local media personalities to satirize the news events of the last year, and proceeds from the money raised go to fund journalism scholarships. You’ll never guess who is behind Louie’s mask… or maybe you might. Some of those moves look eerily familiar. Click here to watch! 0 comment(s) so far on Louie the Clown is…The Super Car Guy?